The present work reports on two epidemiological episodes resulting in acute schistosomiasis involving wealthy persons living in the State of Pernambuco, Brazil. The authors discuss the epidemiological, clinical and serologic characteristics of the acute infections and also the way in which the conditions for transmission occurred. Historically considered as a rural endemic disease, schistosomiasis is gradually expanding into the coastal regions of the State of Pernambuco due to the exodus of rural workers to the urban areas. This migratory process, caused by poverty in the rural areas, encourages people to go to the metropolitan region of Recife in search of work, medical assistance and education. Unemployed people and sugar cane workers infected with S. mansoni come to the urban areas yearning for a better life. Usually they find a position as auxiliary workers in the building market. They generally live in the shantytowns or temporary camps without any sanitation, resulting in the contamination of natural waters. Peridomicile or even domicile focus have been reported on the coastal regions of the state and new sites of active transmission are being detected in tourism and summer vacation resources (Barbosa et al. 1996, 2000). In addition to the biological components, schistosomiasis has social and cultural determinants. The mechanisms of transmission of the disease are very complex when you take into account the biological factors together with the social components and human behaviour. In fact, man can modify the environment creating new transmission sites and specific risk situations for populations which have never been exposed to the disease. This paper highlights the occurrence of two outbreaks of acute schistosomiasis characterized by distinct epidemiological features, related to the accidental transmission of S. mansoni to individuals from the middle to upper classes in Pernambuco. It also describes how the inadequate occupation and organization of space by groups of people may favour the establishment of new sites of active transmission of schistosomiasis. The first episode occurred in the summer of 1992 at Forte Orange beach, in the south of the island of Itamaraca, on the coast of Pernambuco, an area so far considered free of schistosomiasis. On this occasion 13 cases of acute schistosomiasis were reported in individuals who were accidentally exposed to cercariae contamined water. This locality was originally a swampy mangrove area which was backfilled to make way for a summer residential project for the middle to upper class population. Houses were built without any planning for the proper drainage of rainwater. Of the original ecosystem remained two sweet water lagoons populated with Biomphalaria glabrata. Before 1970 there were no reported cases of schistosomiasis at Forte Orange beach. During this time the backfilling changed the characteristic of the mangroves and surrounding area. Workers from rural areas of endemic schistosomiasis were the principal workers, establishing precarious dwellings near the lagoons, the only source of available sweet water. Probably the faecal contamination of the lagoon established the cycle of schistosomiasis transmission in the area. At present, because of the rain, the lagoons overflow spreading the vectors into the streets and backyards, locals which are not very permeable, allowing the persistense of the vector snails for many months. In 11 July 1992, 12 medical students, accompanied by one professor, got together for a day out to play football and have a barbecue. On their return home, as they tried to free a car stuck in the mud, their lower limbs were in contact with contaminated water, followed by intense itching. Of the 13 individuals exposed one was not infected and one was infected but did not show any symptoms (he had a previous history of contact with the river) and 11 had heavy manifestations of acute schistosomiasis. In this latter group, 8 had symptoms from the pre-postural phase (two weeks after infection) which ceased spontaneously in about a week. After two weeks, the symptoms returned with greater intensity in all patients, coinciding with the oviposition stage (Table I). In four patients, due to the intensity of the symptoms, it was necessary to prescribe cortisone at a dosage of 0.5 mg/kg for the first two weeks until the symptoms disappeared. All infected subjects were treated three months after the infection with oxamniquine at a dosage of 15 mg/kg. In 10 patients it was also necessary to combine the treatment with predisone for two-three weeks because symptoms were still present and they had high eosinophils counts. After the treatment there was a gradual clinical improvement in all patients although three patients continued to have high eosinophil counts and one patient had a stool egg count positive, six months after the treatment. Two patients had slightly enlarged liver and spleen for five months after treatment. All patients were retreated with praziquantel, six months after the first treatment. Six patients were submitted to more detailed immunological tests and showed higher IFN-g , IL-4 and IL-5 levels than patients with chronic forms of schistosomiasis (Williams et al. 1994). The second episode resulted in 13 patients with acute schistosomiasis, all members of the same family of middle-upper class, and was also caused by transmission associated to leisure activity. This occurred on a private rural property in the district of Escada, Pernambuco, endemic for schistosomiasis and where the vector is B. straminea. According to the last parasitological survey carried out by the Fundação Nacional de Saúde in 1994, the prevalence of schistosomiasis in the district of Escada was 50.7%, which is considered high respecting to the average prevalence in the State of Pernambuco (20.5%) (Barbosa 1996). The owner of the farm built a swimming pool using the water from the stream, that is a tributary of the Una river, implicated in the transmission of schistosomiasis. 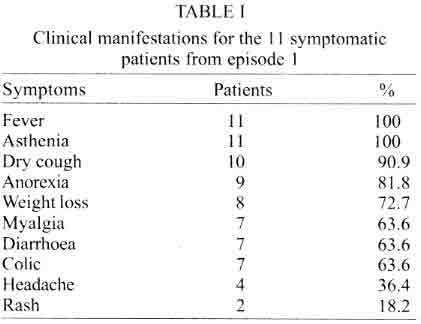 About 20 days after a single exposure, 12 people showed characteristic symptoms described in Table III. Only one of the infected persons did not show any symptoms (he had a previous history of bath in the river). The treatment prescribed was oxamniquine in 9 patients and praziquantel in 3 patients 60 days after the infection and repeated after six months. Two patients that had no eggs of S. mansoni in their serial stool samples, but had eosinophilia and showed symptoms, were positive by specific immuno fluorescence (Table IV). There are similarities between the two episodes, both resulted in acute schistosomiasis, suggesting the infected individuals had not been exposed before. However, they show distinct caractheristics due to different environmental changes caused by the action of man, leadind to the creation of new transmission sites. In addition, the way by which transmission occurred resulted in different infection intensities. In the first episode, the patients had a smaller body area exposed and the time of exposure was lower than in episode 2. However, the intensity of the symptoms was greater than in episode 2. Although the number of eggs in the stool of the patients were not available, factors related to the biological transmission potential of the vectors involved (B. glabrata x B. straminea) and the peculiarities of the two sites of transmission together with the features respecting infections in both episodes, suggest the acquired parasite burdens were different as we will discuss. It is reasonable to propose that the group infected in this first episode acquired a higher number of cercaria because the infected larvae were concentrated in a small water collection and B. glabrata has a hight potential to release large number of cercaria. 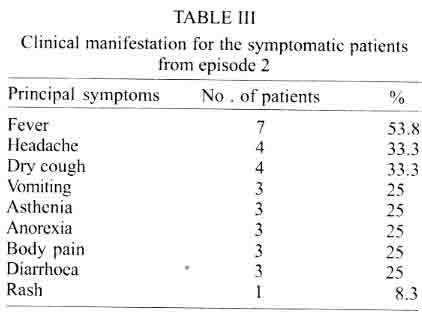 The patients infected in episode 2 showed light symptoms which suggested that they had received low parasite burdens even though they had a longer exposure time. This is explained by the fact that B. straminea, although considered resposible for the high incidence of schistosomiasis in the rural areas of Pernambuco, is biologically less efficient in cercaria production than B. glabrata. Moreover, we should consider the fact that the infection was in running water. With reference to episode 1, the migration of infected rural workers per si was not sufficient for the introduction of the disease in that area. In fact, the participation of many factors and the involvement of those who can establish the transmission and guarantee the maintenance of the active sites of transmission of the disease is also necessary. In addition to the epidemiology and public health problems related reported herein, the paper also highlights the fact that the acute manifestations of schistosomiasis are usually observed in individuals not previously infected, and thus, without any degree of immunoprotection. Barbosa CS 1996. Esquistossomose: reprodução e expansão da endemia no Estado de Pernambuco. Rev Saúde Pública 30: 609-616. Barbosa CS, Barbosa FS 1998. Padrão epidemiológico da esquistossomose em comunidade de pequenos produtores rurais de Pernambuco. Cad Saúde Pública 14: 129-137. Barbosa CS , Pieri OS, Silva CB, Barbosa FS 2000. Urban schistosomiasis in Itamaracá Island, Pernambuco, Brazil: epidemiological factors involved in the recent endemic process. Mem Inst Oswaldo Cruz 93: 265-266. Montenegro SML, Miranda P, Mahanty S, Abath FG, Teixeira K, Coutinho E, Brinkman J, Gonçalves I, Domingues LAW, Domingues AL, Sher A, Wynn T 1999. Cytokine production in acute versus chronic human schistosomiasis mansoni: the cross-regulatory role of IFN-g and interleukin-10 in the responses of peripheral blood mononuclear cells and splenocytes to parasite antigens. J Infec Dis 179: 1502-1514. Williams ME, Montenegro SML, Domingues AL, Wynn T, Teixeira K, Mahanty S, Coutinho A, Sher A 1994. Leukocytes of patients with Schistosoma mansoni respond with a Th2 pattern of cytokines production to mitogen or egg antigens but with Th0 pattern to worm antigens. J Infect Dis 170: 946-954. 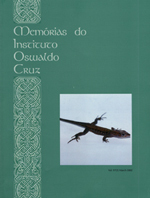 Copyright 2001 Instituto Oswaldo Cruz - Fiocruz.